Megaloblastic anaemia is a macrocytic anaemia resulting from the deficiency of vitamin B12 or folic acid characterised by the presence of megaloblasts in the bone marrow. It has haematological and neurological manifestations. The haematological manifestations are seen with folate as well as vitamin B12 deficiency. Folate deficiency in adults does not affect the nervous system. Cobalamin deficiency is slow and “pure”. Folate deficiency is rapid and “impure”. Deficiecy of vitamin B12 occurs because of loss of intrinsic factor resulting in an isolated defect of B12 absorption. No other nutrients are affected. The body stores of B12 can last months. This results in B12 deficiency being a slow and “pure” deficiency. Symptoms come on slowly, over months. Folate deficiency evolves relatively quickly and is most commonly because of alcoholism or malabsorption. It is associated with other deficiencies and is rapid and “not pure”. Haematological changes resulting from vitamin B12 deficiency and folate deficiency are indistinguishable. Megaloblastic anaemias are macrocytic anaemia but macrocytosis is not specific to megaloblastic anaemia. It is however exceptional for other diseases characterised by macrocytosis to have an mean capsular volume (MCV) > 110fl. This value can considered the threshold above which an anaemia is unlikely to be anything other than megaloblastic anaemia. The earliest change in a megaloblastic anaemia is macrocytosis. This precedes changes in erythrocyte indices. Changes in mean capsular haemoglobin (MCH) follow and then the MCV rises. Haemoglobin usually falls after the MCV increases to >97 fl. 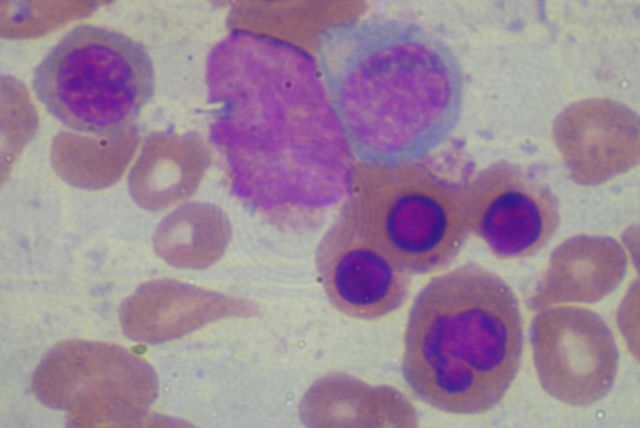 As the severity of anaemia increases the peripheral smear shows aniscytosis and poikilocytosis, nucleated cells, Howell-Jolly bodies and Cabot’s ring. Microcytes and erythrocyte fragments that represent dyserythropoiesis may be seen. Polychromasia is absent and this distinguishes megaloblastic anaemia from haemolytic anaemia. The term megaloblatic anaemia is a misnomer. The disease is actually a panmyelosis. Erythroid, myeloid and megakaryocytic series are affected. Thrombocytopenia and leucopenia (neutropenia and to a lesser extent lymphopenia) usually occur late in the course. It is uncommon for patients with mild anaemia to have platelets and neutrophils but occasionally changes in leucocytes and/or platelets may dominate. Iron deficiency or β-thalassaemia trait result in microcytosis and hypochromia and may incidentally co-exist with megaloblastic anaemia. Co-existence of either of these diseases with megaloblastic anaemia may mask macrocytosis of megaloblastic anaemia. Presence of hypersegmented neutrophils in a patients with normocytic normochromic anaemia should raise the suspicion of a megaloblastic anaemia co-existing with Iron deficiency or β-thalassaemia trait. Cobalamine deficiceny causes neurological dysfunction. Folate deficiency causes symptoms only in children. Children with inborn errors of folate metabolism may have myelopathy, brain dysfunction and seizures. The neurological manifestations of B12 deficiency are a result of a combination of upper motor neuron manifestations from subacute combined degeneration of the spinal cord, sensory and lower motor neuron manifestations from peripheral neuropathy and neurophychiatratic manifestations. Subacute combined degeneration of the spinal cord (SACD) is a degerative disease of the spinal cord involving the posterior and lateral column (corticospinal and spinoceribellar tracts) that starts in the cervical and the thoracic region. The earliest neurological manifestations are impaired sense of vibration and position and symmetric dysesthasia that involve the lower limb. This is frequently associated with sensory ataxia. With progression spastic paraparesis develops. The patients have brisk knee reflexes, reflecting an upper motor neuron involvement and depressed ankle reflex, reflecting a peripheral neuropathy. Bladder involvement is unusual. Some patients may have optic atrophy. Neuropsychiatric manifestation include memory loss, depression, hypomania, paranoid psychosis with auditory and visual hallucinations. Skin and nails can show pigmentations. Mucosa of the villi undergoes megalobkastic change resulting in temporary malabsorption. Neurologic improvement begins within the first week also and is typically complete in 6 weeks to 3 months. Its course is not as predictable as hematologic response and may not be complete.